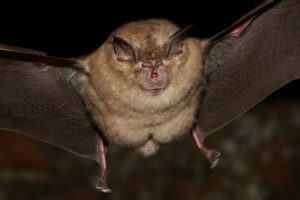 Home » Ecology » When is the Bat Survey Season? You can survey for evidence of bats pretty much all year round, but the methods you use and the evidence you can collect changes significantly through the seasons. Bats are at their most active during the height of the ecological season in the summer, when they can be seen at dusk emerging from their roots to forage for insects throughout the night. Depending on the weather conditions and how warm it is, they start emerging from hibernation in April and can be found flying about until September, or a little later. Although they hibernate through the coldest parts of the winter, some species can occasionally be seen emerging mid-winter to feed, if temperatures allow. Ecological surveys to detect active bats are undertaken between early May and end of September when bats are at their busiest, engaging in foraging and breeding activity. These use special microphones that can pick up the echolocation calls bats make to hunt for prey. These calls are beyond the limit of human hearing, so cannot otherwise be heard. If you are interested in finding out whether bats might be using a particular tree or building as a roost, then dusk and dawn surveys are particularly useful. Looking for bats up to an hour before dusk should allow you to see them emerging from their roosts in the features you are surveying. Similarly, from an hour or so before dawn, you should be able to see bats returning to their roosts to rest for the day. Activity surveys as a transect across a site is useful for detecting how many bats and how active they might be in an area. If the calls are recorded on a recording-device, they can be played back through computer software that helps to determine the species. From October to April is considered the period of bats’ winter hibernation. Activity surveys cannot be undertaken at this time. However, hibernation surveys are possible where roosts are accessible such as in a roof void, but for licensing purposes these surveys can only serve to identify the presence or absence of hibernating bats. In looking for evidence of bats, such as urine stains, feeding remains, droppings and fine scratch marks, an endoscope and close focusing binoculars can be very handy. These can be used to look into narrow cracks and crevices or to observe features high up where access could not otherwise be gained. Follow this link to find more information about bat surveys, or if you would like a bat survey to be undertaken, please contact our consultants to find out how we could be of assistance.